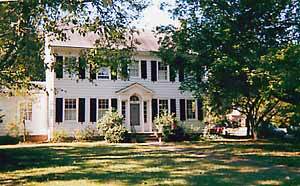 Our Williamsburg VA Bed and Breakfast is just a short walk from Colonial Williamsburg. Elegant and beautifully restored, Alice Person House has a superb, downtown location, with convenient off-street parking. Enjoy Historic Williamsburg's many charming shops and restaurants. William & Mary College, equally historic and chartered in 1693, is just a block away and provides a great setting for morning jogs or walks. Jamestown, Yorktown and Busch Gardens are less than a 15 minute drive. Don't miss the activities that are available year round in Williamsburg! Each season brings something special to our visitors. Christmas in Williamsburg is particularly lovely with the holiday decorations and hand made wreaths. Williamsburg is a fantastic option for New Year's Eve, as our First Night is a spectacular display. February brings Valentine's Day, romance and weekend getaways. The luxury accommodations at our Bed and Breakfast in Williamsburg are a rare find. Many years of collecting have furnished the colonial bedrooms with one-of-a-kind antiques, oriental rugs for hardwood floors, and European linens. A gourmet two-course breakfast is served in our elegant formal dining room. A romantic fireplace in the winter makes breakfast a cozy affair. As Virginia natives ourselves, we are eager to make your stay in Williamsburg, Virginia a romantic, luxurious and memorable one. Luxury rooms with English Antiques, oriental rugs, hardwood floors. Large fluffy terry robes for your use during your stay. 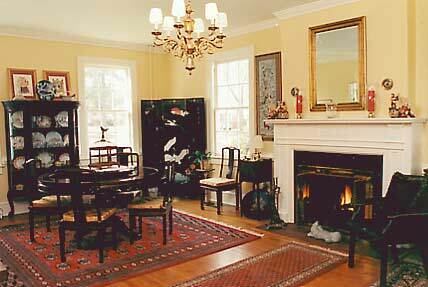 An elegant Formal Parlor, with fireplace, for visiting or reading. 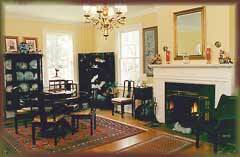 Our cozy Bed and Breakfast in Williamsburg is a pleasant alternative to Colonial Williamsburg Hotels. Call for reservations! "This B&B was friendly,clean,and very convenient to both Colonial Williamsburg and the College of William and Mary.Our room was spacious and the beds were wonderful. Jean was an excellent hostess and we felt that we were visiting family. WiFi and cable were an added plus! Will definately plan to stay here when we return to the Williamsburg area "